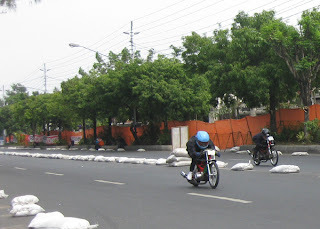 Motorcycle racers from Semarang city appear to dominate the Beetle Eco Secret Drag Bike Championships 2011 which took place at the Circuit Manahan Solo, Sunday (9 / 10). Mastering six of the 16 classes that diperlombakan, Eko remains practically at the top of the standings. "Our data is not yet complete recap. But looking at the results of this fourth series, Eko seems to remain in the top-ranked rider standings," said Committee Chairman True to Heri Purwanto, Sunday (9 / 10) afternoon. Under the Beetle Eco, said Teguh, there Timoty Johan (Surabaya) and Bayu (Grobogan). Both followed a row in second and third. "Up to this fourth series, racers are indeed mastered the top three," said Teguh. 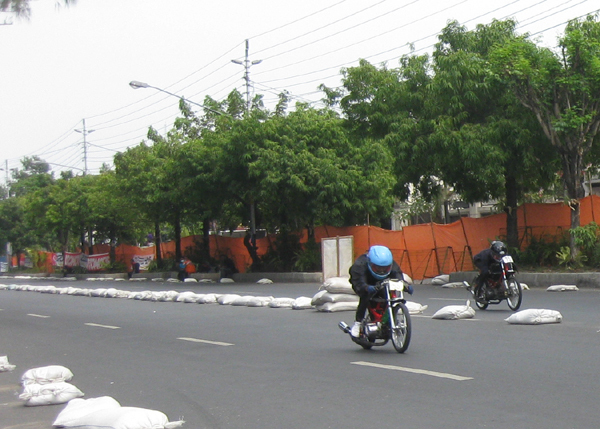 Eco Frog did appear superior on the motor racing contest that took place in Jalan Adi Sucipto, front Manahan Stadium complex, as far as 201 meters. Six classes that followed were dilahapnya with the fastest time recorded. Starting from the standard duck-class 4-stroke 130 cc, OMR tune up Satria FU 155 cc, 250 cc 2 stroke FFA, duck tune up 4 stroke 115 cc, sport tune up 2 stroke 140 cc and duck tune up 4 stroke 200 cc.